Have you ever needed to punch different binding hole patterns? Or is it maybe time to upgrade your punch? If you’re facing either of these considerations then perhaps it’s time to look at getting a heavy duty punch with interchangeable dies. While some manual punches have the versatility to accept multiple die patterns, all of the heavy duty punches come with one standard die of your choice. Now you can see all of the standard interchangeable die choices on the respective punch pages on www.cfsbinds.com. They are shown as options below the punch description and can be purchased individually if you already own the punch. 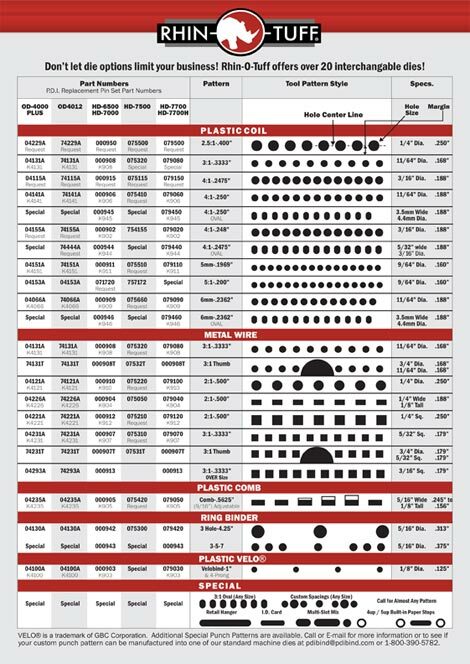 For a visual representation of the PDI Rhin-O-Tuff die choices along with their hole sizes and spacings, click the image below.